Jamia Hamdard Date Sheet 2019 is released in the official website. Students can check the “Notice” for the exam schedules. Jamia Hamdard conducts its Annual and Semester exam every year. The Date Sheet for the annual / semester exam releases in the official site of Jamia Hamdard. Students can check the table for the all-important dates for different courses offered at Jamia Hamdard. Students can check the date & day, time, and courses in Jamia Hamdard University Time Table for annual examination. Jamia Hamdard is conducting its annual examination 2019. Check the article for the more latest information in Jamia Hamdard University Date Sheet 2019. Students appearing for the exam should reach the exam hall 15 minutes earlier. Every student appearing for the annual / semester exam should carry their Admit Card on the Day for the exam. Check the table for the date sheet of annual examinations. Date Sheet: Students can check Jamia Hamdard Date Sheet for the annual exam from, www.jamiahamdard.edu. 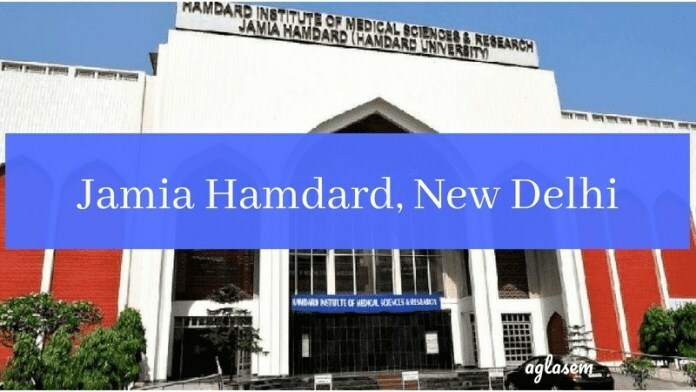 How to check Jamia Hamdard University Date Sheet 2019? Students can check the Jamia Hamdard Date Sheet for the annual exam through the link mentioned above. As mentioned the university releases the date sheet on the website, follow the steps mentioned to check the annual exam date sheet from the website. Visit the official website, www.jamiahamdard.edu. Mobile phones are not allowed inside the exam hall under any circumstances. Any kind of malpractice inside the exam hall will not be entertained such students may be expelled from the annual exam. The Admit Card to attend the annual exam will be issued to the students at the head office of SODL. To collect the Admit Card have to personally along with their I-Card / ID proof, at the head office SODL, Convention Centre Building, Jamia Hamdard, New Delhi. The students have to collect their Admit Card on the prescribed date. Jamia Hamdard Admit Card won’t be issued to any students after the prescribed date. Students while appearing to the annual exam must carry their Admit Card along with them. If the students fail to bring their Admit Card to the exam centre then he/she shall not be entertained in the exam. After the declaration of the result, the Admit Card shall be required for the improvement exam. So, keep the Admit Card safely.